When your engagement session is 8 days after you’re engaged the obvious location choice is where your fiancé proposed, a Mosel Valley engagement session! Alex couldn’t have proposed to Melanie in a more perfect place. Their first date was in Bernkastel, Germany- a small, but unforgettable, vineyard town along the Mosel. Hearing their story as we wandered through the traditional cobblestone streets was such a treat! Alex and Melanie met in Germany, had their first date in Bernkastel, and coming back to the town frequently (which is no surprise, the towns’ many wine festivals and Christmas market are not to be missed!). Alex continued their love story, rooted deeply in the Mosel town, by proposing on a vineyard road overlooking the town. 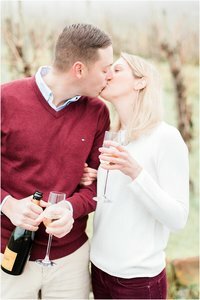 During their engagement session, they celebrated with a bottle of Veuve Clicquot on the vineyard road where Melanie said, “Yes!” I’m so excited we photographed their engagement portraits so promptly! Alex and Melanie will always remember the town exactly how it felt when Alex proposed- sweater weather, dense fog diffusing the sun, the Christmas spirit in the air as the town readies for its’ renowned Weihnachtsmarkt, and the pure joy of being with each other. Alex and Melanie, thank you for guiding me through Bernkastel, telling me your stories, and allowing me the pleasure of photographing this exciting next chapter of your lives together! 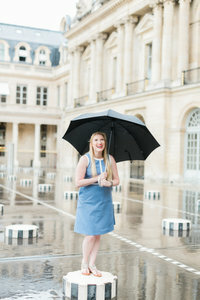 I hope you enjoy your portraits as much as I have enjoyed preparing these for you. And to all Alex and Melanie’s family anxiously awaiting to congratulate the newly engaged couple, I know firsthand how hard it is to be away from your loved ones during exciting times. 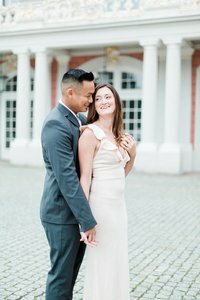 I truly hope these photographs bring you a little closer to Germany and bring you joy while you wait to congratulate Alex and Melanie in person! We are so happy and pleased for the two of you. We pray your Love will always be as it is in these wonderful photos you are sharing with family and friends. November 2018 is going to be an exciting and thrilling time to celebrate your love. What a dreamy engagement session! I love the light and bright feels! What a lovely engagement photoshoot. Love their coordinating outfits. How incredible! To be shooting an engagement session in Germany?! You’re living the dream. These photos are so precious and really capture their love. Beautiful work! I absolutely love my job- that’s for sure! Thank you for your sweet words, Erin!